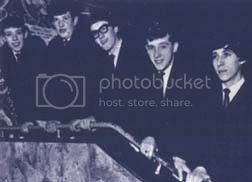 This Walsall based group had four tracks released on a rare compilation album entitled “Brum Beat” that was put out by Decca Records in 1964. The Mountain Kings were formed in 1963 from members of Elander Mason’s Scotty Wood Combo after that band had split due to differences in opinion over musical direction. Lead vocalist Maurice Clawley previously had his own band called Maurice Lee and The Starliners and was also in a group called The Nightriders (not the ones from Birmingham featuring Mike Sheridan). Mel Downing was also from the Nightriders and had played drums for The Midnites with Ian “Sludge” Lees as well as back-up for various big names of the time. Saxophone player Howard “H” Smith was formerly a member of the Scotty Wood Combo. Lead guitarist for the Mountain Kings was Terry Rowley who had also played in Scotty Wood’s group as well as with another local band called The Vikings (not the ones from Birmingham). The group was named “The Mountain Kings” after Peer Gynt’s In The Hall Of The Mountain King which the band often played for their signature tune as a rocked-up version. By early 1964, The Mountain Kings were managed by the legendary Mary “Ma” Regan who along with her husband Joe, were to play a huge part in the development of the 1960s West Midlands music scene. The group were soon playing at the Plaza’s in Handsworth and Old Hill as well as the Small Heath Kavern Club and the Ritz in King’s Heath where they became the resident band. Saxophone player Howard Smith recalled they would sometimes play at all four venues in the same evening! The Mountain Kings were very popular locally and attracted a large following. They even started a Sunday night dance venue at The Casino Club in Walsall, playing to packed houses each time. There was also an occasion where the Mountain Kings backed Welsh singer Ricky Valance when he made a come-back attempt. Ricky’s hit record Tell Laura I Love Her, had got to number one in 1960 but none of his subsequent records had met with similar success. During this time, The Mountain Kings also played alongside some of the biggest acts of the day including The Beatles on two occasions. It was while playing at the Old Hill Plaza in early 1964, the Mountain Kings were noticed by Decca Records producer Michael Barclay who had them record songs for a limited-edition album designed to promote interest in the local area groups of that time. Decca was keen to cash in on the success of the Beatles by signing up similar sounding groups and with the Liverpool area already picked over, the West Midlands music scene had become the focus of attention. Other local bands included on the album were; The Blue Stars; The Kavern Four; Dave Lacey & The Corvettes; and The Strangers. The LP was titled “Brum Beat” and featured an enthusiastic promotional insert written by Dennis Detheridge who was editor of the Midland Beat newspaper. Although the Mountain Kings had not previously made any records other than some private recordings done at Domino Sound Studios, the group had a total of four great tracks – all original compositions – included on the Brum Beat album. These were: You Left Me Alone; Don’t You Know; There’ll Be Times; and Can’t You See. The songs were all high-energy dance numbers composed by Terry Rowley and Maurice Clawley except for Can’t You See which was a group composition. 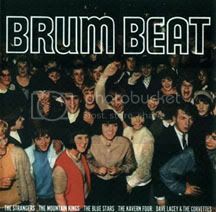 Coincidentally, there was another album released on the Dial Records label in 1964 also called “Brum Beat” which featured bands from Birmingham. The Mountain Kings continued to play to large audiences until 1966 when lead guitarist Terry Rowley decided to leave. He joined the Wolverhampton group The Montanas who made several records and came very close to attaining national success. Terry Rowley later became a founding member of the well-known rock band Trapeze. The Mountain Kings continued on for a while but it was never the same and they eventually disbanded. Bass guitarist Robert Smith continued playing with other local bands during the rest of the 1960s. Saxophonist Howard Smith and drummer Mel Downing joined a Walsall-based group called The KopiKats who later became The Townsmen. This band played the local pub and club circuit until disbanding in 1968.
for their assistance in writing this feature. as singer for mountain kings i believe it was a good L P but you left me alone and therll be times should have been singles Also parting with Scotty Wood was a grave mistake as the original combo was the best band I ever worked with including the big names !